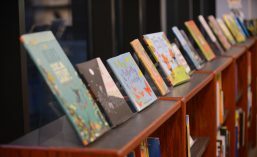 The Butler Center continues to feature books from our collections that highlight one or more of the core values of children’s librarianship (collaboration, excellence, inclusiveness, innovation, integrity and respect, leadership and responsiveness). This week’s book, Same But Different: Teen Life on the Autism Express embodies “inclusiveness”, “collaboration” and “responsiveness”. Callie and Charlie are the fictional representations of real-life teenage twins, Ryan and RJ Peete. They share their story, which resembles those of many other teenagers on the autism spectrum and their families, to let readers into the intimate thoughts of Charlie, who is autistic and his twin sister, Callie, who is not. Each chapter is told in the alternating voice of each twin as they explore the range of challenges and triumphs typical of young adults but complicated by the life-altering effects of autism. The story begins with their reflection on how they feel about their first day of school where the twins are separated for the first time as Callie enters 10th grade and Charlie repeats 9th grade. Their separation is met with both a sense of freedom from their constant partnership and trepidation as they experience school without their twin. Callie, who has been a perpetual supporter and advocate for her brother worries that, without her help, Charlie will be too vulnerable and taken advantage of by less sensitive classmates. Charlie is anxious about starting a new routine and being placed in a special education class which comes with its own negative stigma. The Peetes take turns lending their perspective to what it is like to attend school, date, eat meals and vacation together. Both of their voices provide insight into their actions and reveal the rationale behind them, giving readers two sides of the story to consider. Members of the Peete family have taken on a follow up to their picture book, My Brother Charlie (Scholastic, 2010), told from Callie’s perspective about her 10-year old brother Charlie’s autism. Same But Different is an honest and courageous exploration of the thoughts and feelings shared by their now teenage counterparts. Their story is straightforward and engaging. Their experiences can be appreciated by readers with and without autism. A substantive resource guide on autism and transitioning through adolescence with autism is included with links to websites, guides, fact sheets, education and training opportunities, and videos. This entry was posted in Scholastic, Uncategorized. Bookmark the permalink.